At this year’s Half Century of Progress, Keith and I met up with several owners of military tractors and had the privilege meeting up with Ed and Cindy Warns of Ogden, Illinois. The Warns had their 1956 Allis Chalmers Shop Mule that was built to move planes around. “It came out of the old Buda plant,” Ed said providing a bit of history. Ed’s shop mule was built for the Champaign, Illinois Railway Express Agency (REA Express) and used at the Depot. “They were the forerunner to UPS,” Ed said. Ed, a mechanic for the post office Champaign fleet had fun taking his shop mule out to the Chanute Air Museum and playing tug. Curt Arsen one of the museum staff that helped restore the Mustang, helped Ed hook up the mule to a Lockheed Aircraft Super Constellation 141311 that is on loan at the museum from the Navy for a photo op. This Connie was just one of the planes onhand at the Chanute Air Museum. While at the show we went through one plane and heard military history from a former Veteran. 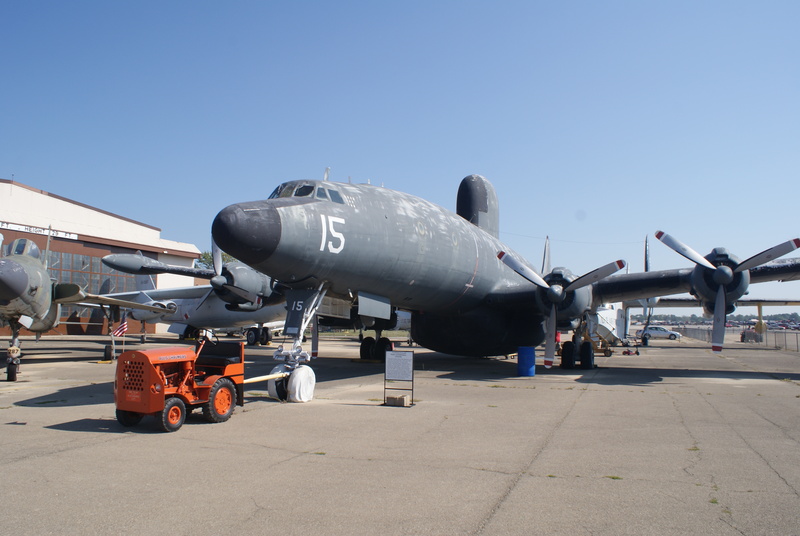 The Chanute Air Museum has a collection of more than 3,000 artifacts that includes over 30 aircraft. Anyone that likes air history will enjoy a visit to this great air museum. Call 217-893-1613 for information about a visit.